All the Buddleia are blooming in my garden. 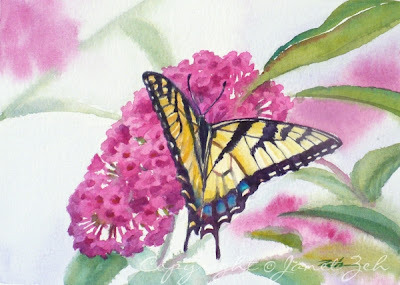 They really live up to their common name of Butterfly Bush. All day, there are various types of butterflies attracted to their sweet-smelling blooms, especially the lovely Tiger Swallowtail. Can't blame them. A heavenly scent wafts from the flowers each time I walk past. 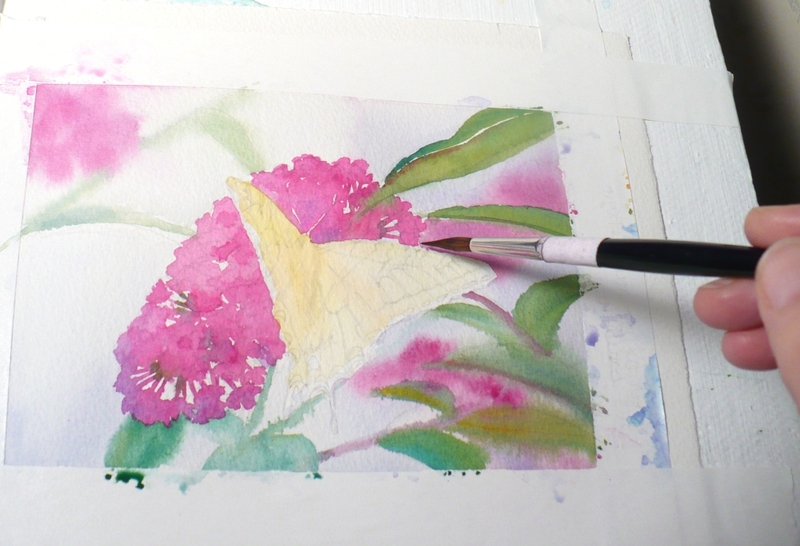 The contrast of the yellow swallowtail against the magenta pink bloom was delightful, so I decided to paint the scene. I used wet-into-wet watercolor washes in the background to keep all that soft and out of focus so the foreground would pop out. You can maybe see the wet paint dripping from the paper in the demo picture. Click the images to see them enlarged. The original painting is sold. If you would like to order a print, please contact me. Thanks for stopping by. Have a beautiful day!